For more than 1 year, I have been posting free tricks and modded apps to get free Internet, SMS etc. Now, I'm here with 3 best ways to get free recharge on your android phone. These are 100% legal ways and very easy to earn too. From these apps/Sites you can turn your leisure times to get free talktime on your android phone. I have been using these and earning an average 10RS/day from each by spending less than 20 minutes in total. Mcent is one of the famous ways to get free recharge. They pays for installing the apps they suggests on your phone. 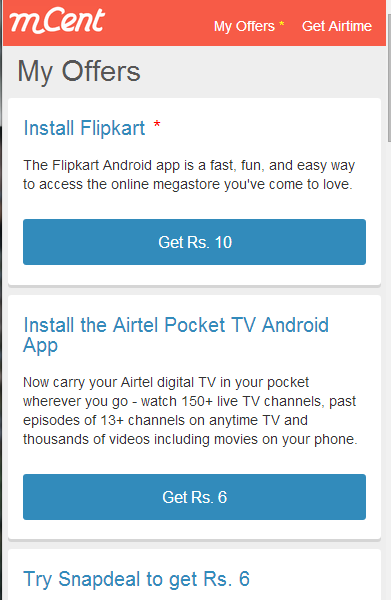 They are usually small apps of size 1-10 MB and you'll get Rs.1-10 for each installation. Sometimes there will be some other works like surveys, signup to some sites etc which gives some more talktime. Follow the steps below. Signup now and You can get atleast 50Rs in the first day itself. In the coming days, you can earn 5-50Rs / day according to offer availability. It usualy takes less than 5 minutes to complete an offer. Note: Use this link to get a special offer in which you can earn Rs.10 at. the time of signup itself! Ladoo is almost similar to Mcent. But the difference is that Ladooo itself is an android app. Just like mcent, download and install the apps suggested by Ladooo. Follow the instructions below. There is no need of a signup. At the time of first start, they'll ask a simple question. Just a YES/NO Question. Enter the correct answer (If you got it wrong, you can enter again! ) and You'll get Rs. 2 instantly as signup bonus. Another way to earn free talk time is Madlock. You can download it from google play. Try it out! Note: There are some hacking tricks from which you can earn hundreds and thousands of rupees free recharge by spending less than 1hour per day. Follow the instructions above and send PM on our facebook page if you want to know that. I won't publish that on this blog. Try this new hacked url! Starting bonus is 150! Unistall mcent and then again install mcent with this link and register yourself with another number and write the code recieved on that number and install any app which you have not installed earlier. It is 100% working in all states of india except jammu and kashmir.